This webpage is no longer being updated and retained for historical interest. Many colleges and universities have secret leadership societies. For example, the movie ‘The Skulls’ is based on Yale’s famous ‘Skull and Bones’ organization. 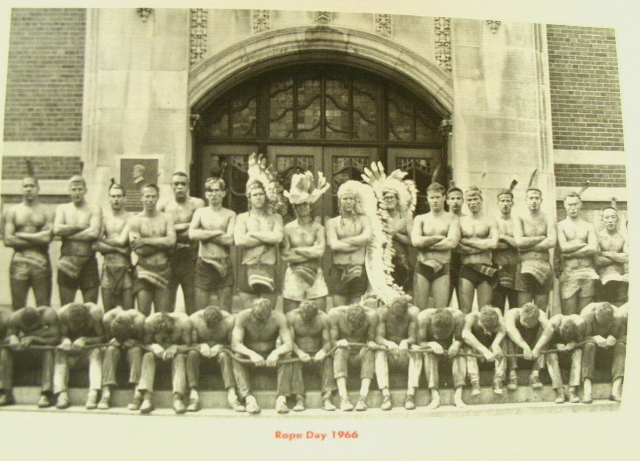 The largest and oldest society at the University of Michigan was known as ‘Michigumua’ from 1902 until 2007, when the group changed their name to “Order of Angell” and decided to release the names of all new members. Michigamua received a great deal of publicity when a coalition of students who claimed their practices were racist and offensive to students of color invaded their meeting rooms in the top floors of the student union. This page contains the names of organization members between 1999 and 2007. Organizational affiliations are listed for identification only. For much more about the organization, please see my previous posts on the topic. There exists at least two other secret leadership societies at the University of Michigan – Vulcan (for Engineers) and Phoenix (formerly for women only, when Michigamua was for men). Phoenix is a campus “honor society” which also used to have an office in the Tower of the Michigan Union. They tell their members they are an “anonymous” not a “secret” society. In 2004, new members of Phoenix received exclusive tour of the Union’s “tower”, in violation of the University’s policies. If you are interested in researching Michigamua’s history, the Bentley Historical Library has a variety of information related to their history. For a sampling of some documents I have found in my research, see this page. Please contact me regarding any needed corrections. I am an Old member and wish to reconnect.